The GEMI SD Planner™ and GEMI SD Gateway is a detailed, comprehensive planning tool that you can use to establish baseline performance, assess opportunities, set goals, develop action plans and evaluate progress towards your sustainable development objectives. This software tool was created because the members of GEMI recognize the need and opportunity for business to address environmental, economic and social issues in a way that creates business value. SD Planner ™ is a detailed, comprehensive planning tool that you can use to establish baseline performance, assess opportunities, set goals, develop action plans and evaluate progress towards your sustainable development objectives. Use of this tool will assist you in identifying the critical sustainable development issues that are important to your business activities. SD Planner™ is not a Code of Conduct for companies. It is not designed to suggest that companies should be actively engaged in all of the elements. It is a tool to be used internally within companies that recognize the importance of systematically considering environmental, economic development and social equity issues in a way that creates the most value for their business enterprise. 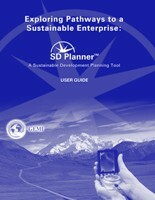 SD Planner ™ is designed for use by a variety of different groups within a company/organization. It is optimized for use by a business unit, but it can also be used by a corporate group on behalf of the company as a whole. Typically, a functional group will assume a lead role for applying the tool, and a specific individual or team will be responsible for actually entering information and generating results. However, because of the broad scope of the tool, it is likely that this team will need to interface with representatives from several functional areas, potentially including strategic planning, marketing, communications, human resources, operations, distribution, research and development, finance and environmental, health and safety. The team will also need to define the organizational scope of the tool’s application (e.g., wholly owned subsidiaries, partially owned subsidiaries, joint ventures, contractors, investments). A primary information gatherer can be assigned to collect all of the responses necessary to complete the diagnostic and assessment portions of SD Planner™. This can be accomplished through a series of interviews with functional specialists. The primary user can generate paper copies of the assessment forms for the various SD elements, distribute these to appropriate specialists along with relevant guidance, and then compile the results. The primary user can invite the required specialists to complete the assessments electronically. This should be done on a single hardware platform, since SD Planner™ does not support integration of distributed data from multiple sources. Screening : This step is the starting point for any application, and enables you to identify your company context, key issues, and initial focus. This information will influence SD Planner™’s recommendations regarding potential goals and actions. Self-Evaluation enables you to apply a set of assessment templates that characterize your company’s SD status for specified elements. Goal-Setting enables you to set goals for specified SD elements. Gap Analysis enables you, at any point during the assessment, to compare status against goals for specified SD elements, and thus identify gaps. Action Planning: This step proposes actions that will address the gaps identified above, and enables you to print action planning reports for specified SD elements. Context-specific guidance is available at all times to help define and illustrate the SD concepts being presented. SD Planner™ is extremely flexible, so that you can work on the above steps for selected SD elements in any order, and can save partially completed assessments for later revision and updating. Most likely, SD Planner™ will be used over an extended period of time, involving multiple sessions of information gathering, assessment, revision, planning, and updating. For companies that embark upon an SD program, it can serve as an ongoing repository of status information to support tracking of progress. In addition, the graphical nature of SD Planner™ allows it to be used not only for assessment and planning purposes, but also to support status briefings to management, dialogues with internal and external stakeholders, and development of communication materials.